Thank you and a warm welcome to our new subscribers! The PARCC is coming up fast. 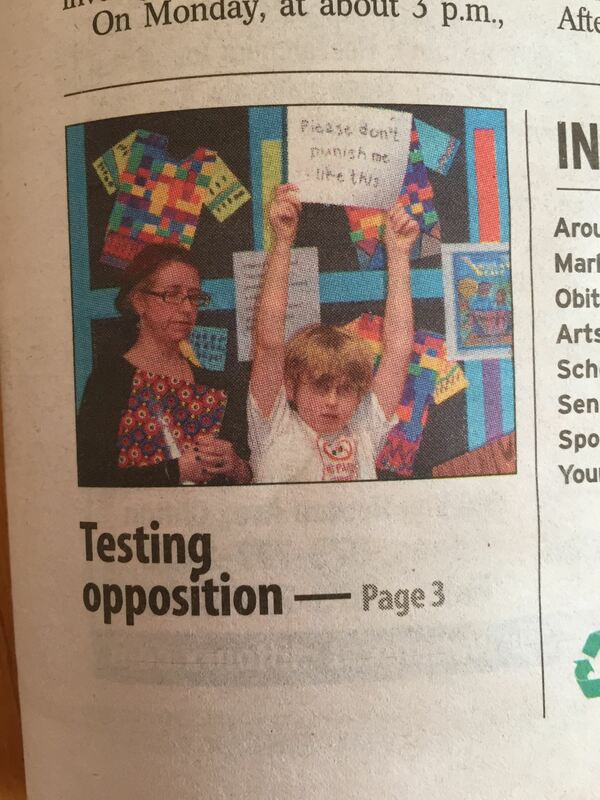 Parents all over New Jersey are speaking up. This image has been shared widely online, especially via Save Our Schools New Jersey Facebook post last week. As of this writing, it has been “liked” 183 times and shared 60 times. If you haven’t been to the SOSNJ website or Facebook page yet, go there! Excellent information updated daily, and some seriously awesome advocacy work by all volunteer members that will inspire you, give you hope, and move you to action. 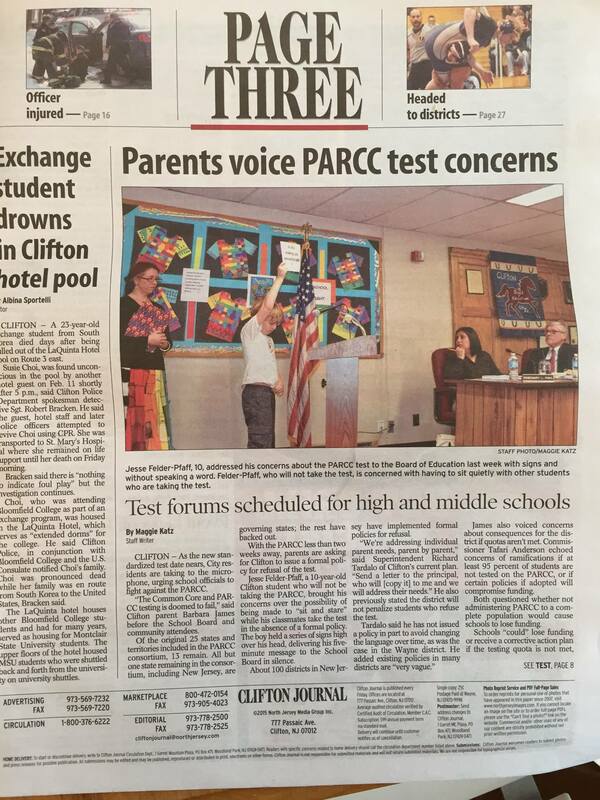 Controversy continues to escalate around the PARCC tests replacing NJASK — and for good reason. People should pay close attention to why the vast majority of states planning to administer the PARCC have ultimately rejected it. Their reasons are the same ones we should all consider in deciding whether to subject our own children and teachers to these experimental new tests that lack credibility and unfairly discriminate. The PARCC is designed to fail 60-70 percent of students — this has been borne out around the country, including among high achievers. While the scores won’t affect placement this year, make no mistake; that data will forever remain on the record of every child who takes the PARCC. Their scores will factor into teacher and school evaluations this year. Superintendent Penny MacCormack has continued to repeat our state’s empty mantra — that the PARCC will provide more data than the NJASK ever did. This is simply not true. Teachers will never see the convoluted, developmentally inappropriate questions on the PARCC, let alone what students answered right or wrong. With no diagnostic value, the PARCC will disrupt 12-14 days versus two for NJASK. At an estimated cost of $80 per student, Montclair will shell out roughly $350,000-$400,000. That’s excluding the district’s massive $2.1 million tech upgrades that went way over budget — and were made with no tech plan in place. Despite MacCormack’s ongoing insistence to the contrary, last week’s report at the BOE meeting made it clear that Montclair schools are not tech-ready for the PARCC. At the same meeting, our Board of Education put to rest Superintendent MacCormack’s persistent denial that families have the right to refuse the PARCC. Montclair joined 134 other districts and unanimously passed an official refusal policy. Every family should seriously consider using it. 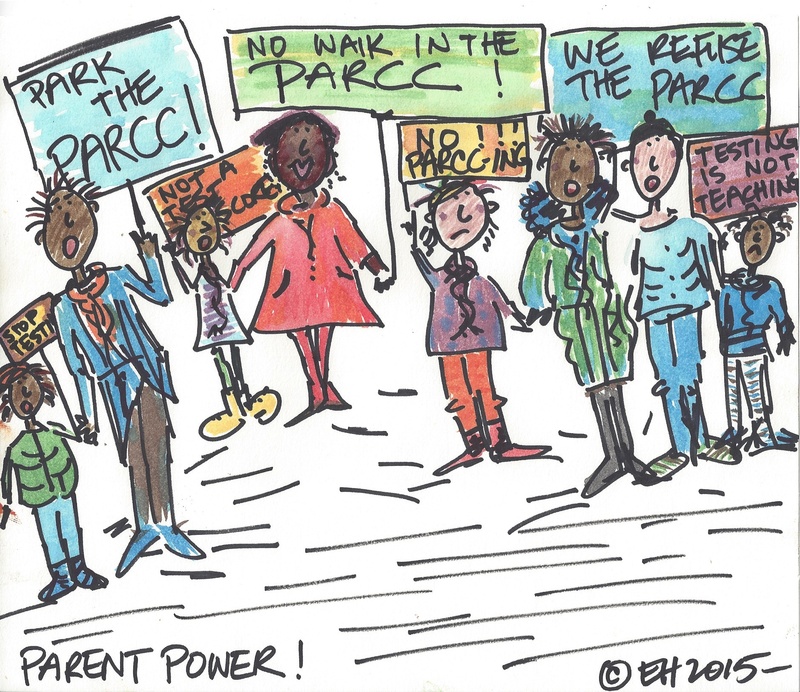 New Jersey parents and residents are waking up and pushing back against the PARCC in droves! Grassroots Cares About Schools groups are continuing to form all over the state. 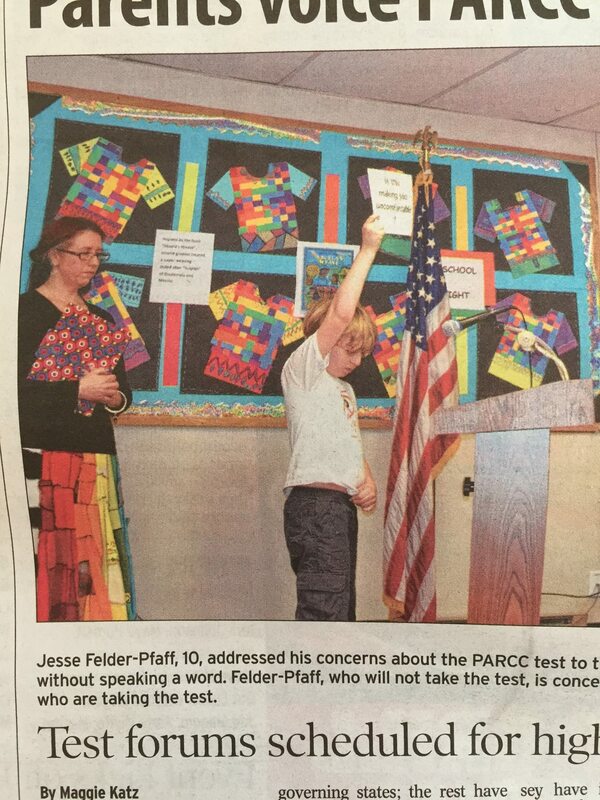 And last week in neighboring Clifton, NJ, via the Clifton Journal, families stood up to protest the PARCC at their local Board meeting. And, if you’re new to this conversation, or trying to get a deeper understanding of what’s going on, or just want to read a really excellent piece, Jersey Jazzman’s post offers an enlightening and comprehensive, spot-on overview of the state of public education affairs. 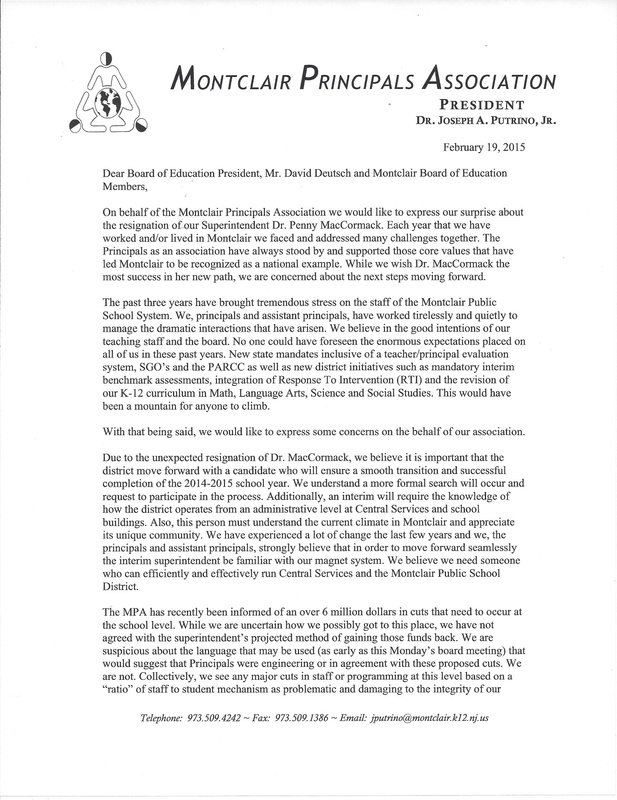 Superintendent MacCormack resigned, and her Assistant, Matthew Frankel, has also resigned. The MPS budget is showing a shortfall of $6M! 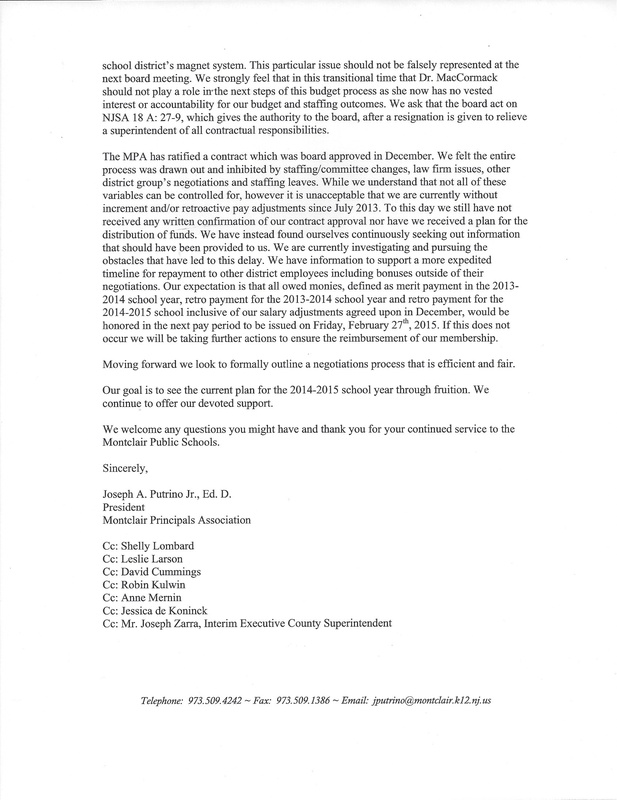 The MPS principals sent a letter /statement to the MBOE. The public portion of the meeting is expected to begin at 7:30pm. Please check the MCAS fb page for updates. Come to speak or come to listen and show your support for our community. We are in this together. PARENT POWER! This entry was posted in Budget & funding, Elementary School, High School, Middle School, Montclair, New Jersey, Opt Out-Refuse the Tests, Uncategorized and tagged Clifton, Clifton Journal, illustration, Jersey Jazzman, letter to editor, MBOE meeting, PARCC, PARCC protest, parent power, Penny MacCormack resignation, Save Our Schools NJ. Bookmark the permalink.